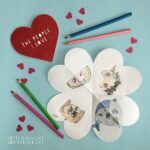 Today, I welcome the awesome Barley & Birch with a super fun Valentine’s Day Craft for kids – make some of these fantastic Conversation Heart BFFs!! 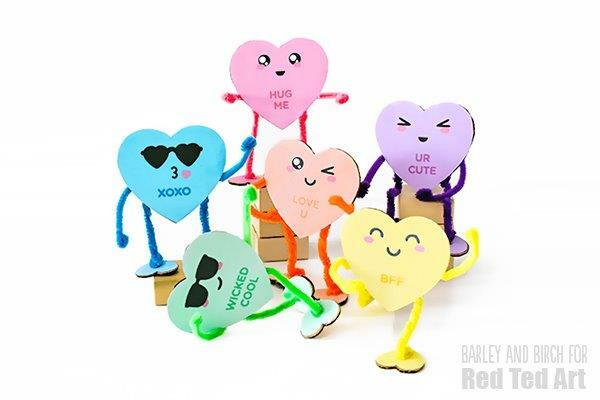 Or moveable Conversation Heart Dudes. 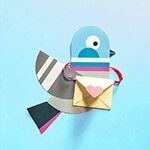 What a quirky and fun craft for Valentines. And it comes complete with free printable to make life extra easy for you! 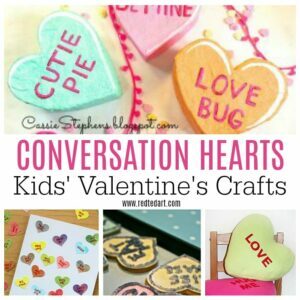 Love Conversation Hearts? 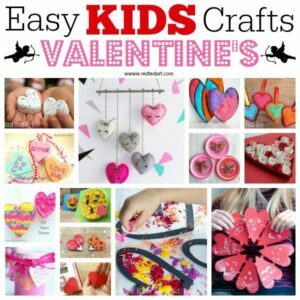 We have a whole SET of Conversation Heart Crafts for you to browse. Can you believe we’re already in to a new year?! 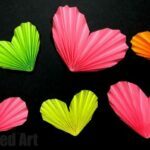 It is such an honor to be participating in Maggy’s 31 Days of Love, and I can’t think of a better way to kick off 2019 than with a project inspired by caring, color and tons of personality! I’m Amanda from barley & birch, a cozy little spot where I share art, craft and design DIY’s that creative kids can make with their families. 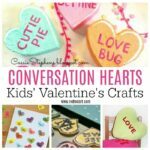 These sweet poseable conversation hearts are chock full of character and an easy DIY you can make with the simplest of supplies! 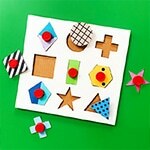 Download the free pre-designed templates, or use the simple shapes and steps to create your own from scratch. 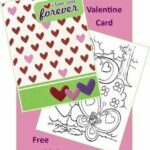 Step 1: Download and print the free heart template pages you’ll need. 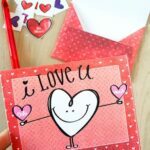 Page 1 can be used for pre-designed hearts, page 2 has blank hearts you can add your own faces to, and page 3 has templates you can use to trace and paint your own hearts, expression examples, and pre-designed “feet”. Step 2: Cut out the template pieces you’ll need (I used the pre-designed hearts and feet). Step 3: Trace the large heart “body” and (2) small heart “feet” on to a piece of scrap cardboard. 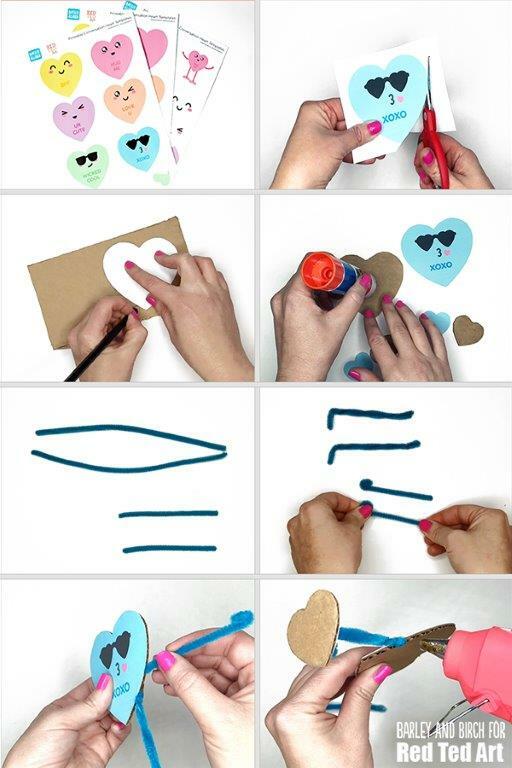 Cut out with craft scissors or an X-Acto knife, then glue the pre-designed heart templates on using a glue stick. Step 4: Gather (2) pipe cleaners and cut them both two-thirds of the way across the length, to create (2) “legs” that are 2:3 of the original length, and 2 (arms) that are 1:3 of the original length. Step 5: Fold your pipe cleaner “leg” pieces in half, twist a few times, then bend at the bottom to create a small “foot”. Hot glue the pipe cleaner “foot” to your cardboard heart feet (with the points of the cardboard hearts facing toward the back). Step 7: Gently push the legs and arms in to the corrugated cardboard at the bottom and sides. Add a few dots of hot glue to secure them so you can move your arms and legs. 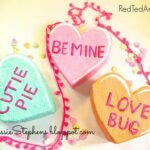 If you’d like, you can glue the blank heart templates to the back of your conversation hearts to finish them. 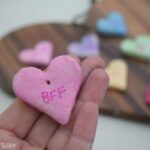 You can write your own special message on the back of your conversation hearts for a super special interactive Valentine, or make the whole collection for endless poseable fun! Thanks for inviting us to 31 Days of Love again this year Maggy, it’s always so much fun! 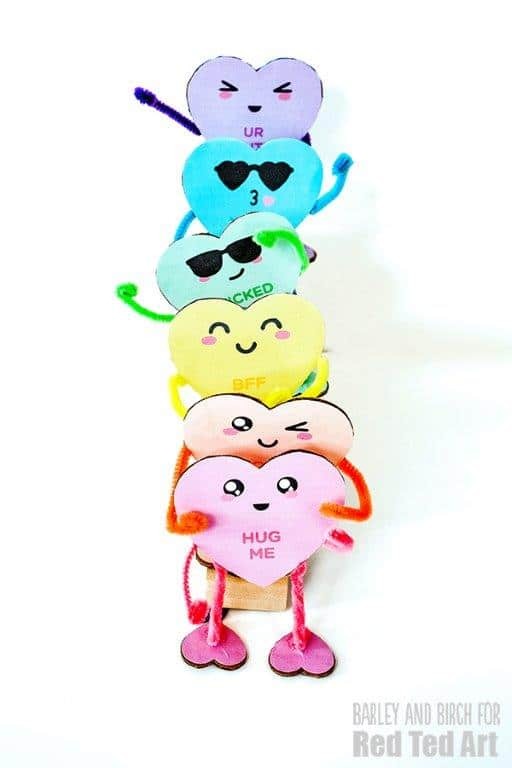 Sending ALL the conversation hearts your way! 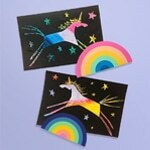 My daughter can’t wait to make these!! 🙂 they are adorable!! 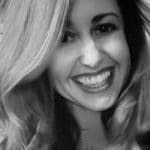 Thank you so much for such a fun guest post!